In order to make the process more secure, efficient and convenient for patients, Fujitsu and HT Systems are partnering to offer PatientSecure, a comprehensive biometric patient identification management system. The PatientSecure system uses the Fujitsu PalmSecure™ biometric authentication sensor which uses near infrared light to capture the vein pattern in a patient’s palm. 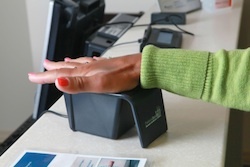 The biometric sensor converts the palm vein image into a digital record that is associated with a patient’s medical records. PatientSecure is already being used in the Carolinas HealthCare System. SUNNYVALE, Calif. and TAMPA, Fla., — Identity management in a busy healthcare setting is a hectic and time consuming process, especially when it must be repeated with each patient’s visit. Fujitsu Computer Products of America, Inc., a leading supplier of innovative computer products, and HT Systems, a healthcare technology company, today announced their collaboration on PatientSecure, a comprehensive patient identification management solution. HT Systems and Fujitsu will demonstrate the PatientSecure device at the American Association of Healthcare Administrative Management (AAHAM) Conference, Sept. 26-28, in Ft. Lauderdale, Fl. The PatientSecure solution incorporates the Fujitsu PalmSecure™ biometric authentication sensor that uses near infrared light to capture the vein pattern in a patient’s palm, providing a highly reliable and accurate form of authentication. Utilizing the latest in biometric security technology, the biometric sensor converts the palm vein image into a digital record that is associated with a patient’s medical records. The combined technology solution from HT Systems protects patients from identity theft and insurance fraud, and ensures that each individual receives the proper medical care. “By implementing PatientSecure, hospitals realize an immediate increase in staff efficiency and patient satisfaction. Registration and re-admittance times for patients are reduced five to ten fold. In addition, because the patient’s biometric information is married to the patient’s medical record, you can be certain that the right medical care is given to the right person,” said David Wiener, vice president, sales and marketing, HT Systems. “PatientSecure has already been deployed at Carolinas HealthCare System, a 19-hospital health system, creating the largest user base for any biometrically powered patient registration solution in North America. We believe that through our alliance with HT Systems, the patients and hospital staff that interact with the PatientSecure solution will provide a greater sense of security in today’s modern world of medicine,” Joel Hagberg, vice president, marketing and business development, Fujitsu Computer Products of America, Inc.
To learn more about the technology and receive a demonstration, visit the HT Systems booth #56, or visit http://www.patientsecure.com/. Location: Marriott Harbor Beach Resort & Spa, Ft. Lauderdale, Fl. HT Systems is a healthcare technology company, providing practical time saving solutions for the busy healthcare facility. From Biometric Patient Identification Systems to Revenue Cycle Management Products, HT Systems is in the forefront of providing integrated hardware/software solutions to the healthcare industry. HT Systems partners with its clients to develop solutions, specific to the client’s environment. Utilizing cutting edge technology HT Systems makes implementation quick and effortless. With over 15 years of healthcare and healthcare technology experience, HT Systems is poised to be an industry leader for health care providers by delivering robust solutions today. Headquartered in Tampa, FL, HT Systems can provide services throughout the US. For more information, please see: http://www.patientsecure.com/ or call 813-777-9888. Fujitsu is a leading provider of customer-focused IT and communications solutions for the global marketplace. Pace-setting device technologies, highly reliable computing and communications products, and a worldwide corps of systems and services experts uniquely position Fujitsu to deliver comprehensive solutions that open up infinite possibilities for its customers’ success. Headquartered in Tokyo, Fujitsu Limited reported consolidated revenues of 5.1 trillion yen (US$43.2 billion) for the fiscal year ending March 31, 2007. See http://www.fujitsu.com/ for further information. Fujitsu Computer Products of America, Inc. conducts engineering and marketing activities in Sunnyvale, CA and sales operations throughout the United States. Fujitsu Computer Products of America currently offers products and services including scanners and scanner maintenance, hard disk drives, palm vein recognition technology and 10Gb Ethernet switches. Fujitsu Computer Products of America is located at 1255 East Arques Avenue, Sunnyvale, CA, 94085. For more information about Fujitsu products and services, call us at 800-626-4686 or 408-746-7000. For more information, please see: http://us.fujitsu.com/fcpa.